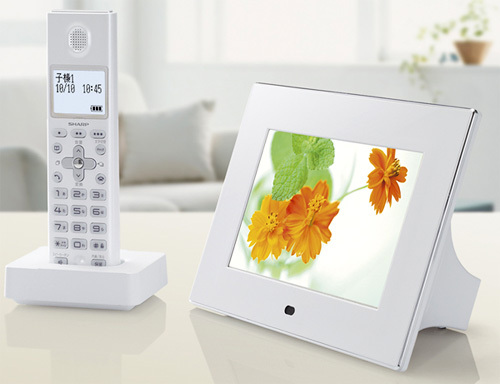 Sharp's New Cordless Phone/Digital Photo Frame Combines Two Devices I Don't Need | OhGizmo! Congratulations to Sharp for combining two devices that most tech-savvy consumers have no use for. Their JD-7C1CL/CW cordless landline phone includes a generous 7-inch LCD touch screen (800×480 resolution) that can be used for general phone functions like checking voicemail, accessing your phone book etc. and when not in use it doubles as a digital photo frame. The 128MB of storage on board isn’t exactly generous, and while you can wirelessly send photos from a cellphone to the frame, it only supports IR so be prepared to wait a while if your phone ‘s camera is of the many megapixel variety. Land-line doesn't necessarily limit the phone. My VOIP connection accepts any regular phone.